Meatballs may not make you think of Mexican food. I would like to take credit for developing some sort of Italian/Mexican fusion soup, but Mexican Meatball soup is an existing dish. 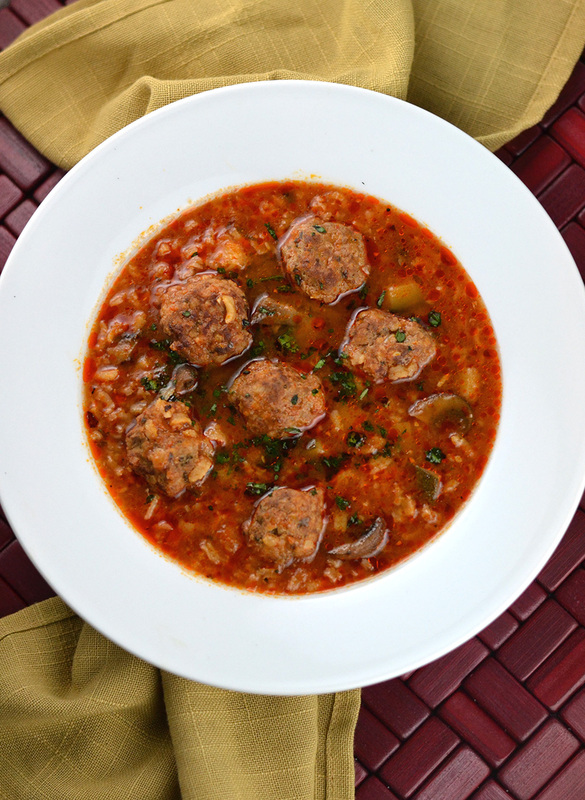 Frequently referred to by its Spanish name, Sopa de Albondigas, this basic soup can be made a number of different ways. Some include vegetables, rice, and herbs while others are mainly just meatballs, usually made of beef such as sirloin. I like additional inclusions in my Meatball soup and this spicy version chock-full of tasty textures and flavors, really fits the bill. Although my grandmother had an affinity for Mexican food and some of her recipes (like Refried Beans) are amazing, this soup was adapted from “The New York Times Cookbook,” by Craig Claiborne. This fairly massive everything cookbook was originally written during the early 1960’s, around the same time as my grandmother’s cookbooks. Claiborne, the New York Times food editor and reviewer at the time, often wrote favorable reviews and tidbits about my grandmother and her cooking and baking. With her frequent trips to Mexico, I like to imagine my grandmother exchanging authentic Mexican cooking tips with Claiborne. This recipe might not be traditional, but it is hearty and delicious, especially on a cold fall (or winter) day. 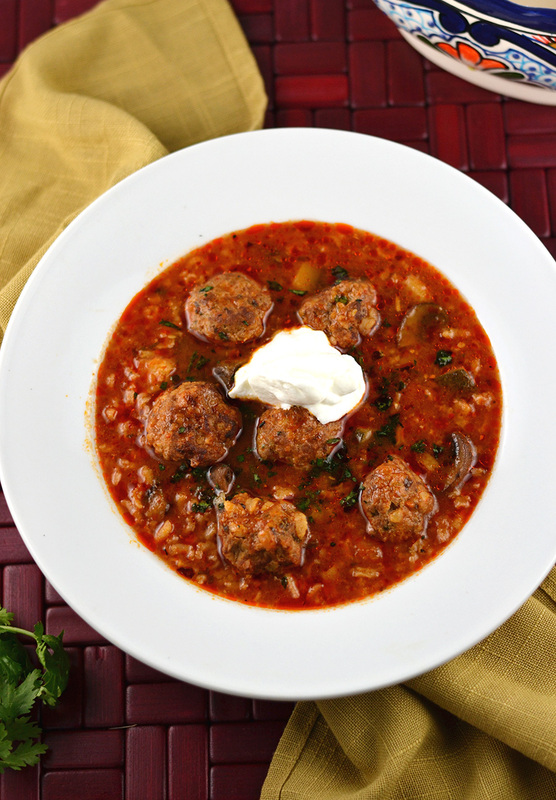 So what differentiates this Mexican Meatball Soup from the other recipes you might find? For starters, the addition of chipotle peppers. The spicy inexpensive pepper that shares a name with the well-known restaurant chain, adds heat and a little smoky flavor to the soup – but be careful not to add too many, they get pretty spicy when the base of the soup is pureed (I learned the hard way). Another highlight of this soup are the meatballs themselves. I was pleasantly surprised by how flavorful and moist these simple beef meatballs were. They really are the best part of the soup (as they should be). Simple ingredients, a little spice, and a touch of authenticity that my grandmother would appreciate, makes this soup another oldie but goodie for the recipe books. Place the meat in a medium mixing bowl. Heat 1 tablespoon of the vegetable oil in a small skillet and add ¼ cup of the onions and 1 teaspoon of the garlic. Cook, stirring, until the onions wilt. Let cool briefly and add this to the meat. Add the breadcrumbs, coriander, oregano, cumin, egg, and salt and pepper to taste (about a teaspoon of each but you can test the seasoning by cooking a mini meatball from the mixture). Mix well. Shape the mixture into 24 meatballs of equal size. Heat the remaining vegetable oil in a saucepan over medium heat. Add the meatballs and cook until just browned on all sides. Remove meatballs from pan and set aside. Add 1 tablespoon of the olive oil to the pan and add remaining onions and garlic. Cook, stirring, until translucent. Add the tomatoes and the chipotle peppers and let simmer about 10 minutes, stirring often. Pour the mixture into the container of a food processor and blend thoroughly. In the same saucepan, heat the remaining 2 tablespoons olive oil over medium heat. Add the sliced mushrooms and diced zucchini. Saute until just barely softened. Return the tomato chipotle mixture to the saucepan. Add the stock, tomato juice, and ½ cup water and bring to a boil. Add rice and the meatballs and let simmer about 20 minutes, until rice is cooked through. Carefully skim the surface as the soup cooks. Serve in hot soup bowls garnished with additional chopped coriander and sour cream. Thanks Suzanne! That’s great. I hope it all goes well and everyone enjoys it.